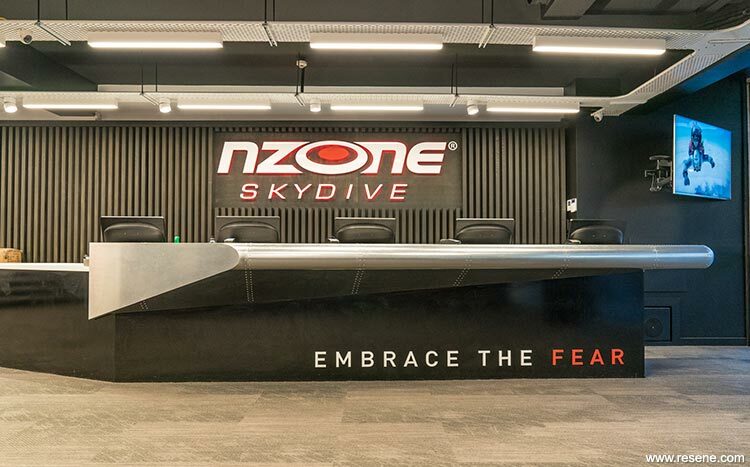 The client, NZONE Skydive, identified the existing Shotover Street tenancy as having a busy location and suitable footprint size but also a building fabric desperately in need of renovation and repair. A slow process of peeling away the layers of leftover materials from previous tenancies coupled with new structural members resulted in an open clear space and presented a fantastic backdrop for a fitout with high visual impact. 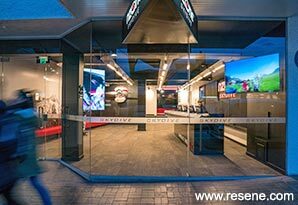 With the client’s branding having an existing strong colour and experiential identify, a sharp fitout was needed. Every element needed to be considered to provide a space encompassing the overriding branding concept and to create a seamless experience for the customers. While care was taken to not fill the space with too many visual or physical elements, as the space is often full with customers before trips begin, the clients also wanted the space to look engaged when less full. This lead to the different planes, walls, floors and ceilings, being treated in large sections rather than broken up. The concrete ceiling was exposed for extra height and the wall structure simplified, removing as many columns and steps as possible. The floor was treated as a solid background. The application and colour of the finishes needed to promote the feeling of excitement and a little bit of trepidation, key elements in the identity of the product. The contrast between the main colours of black, white and accent red in signage and upholstery guided the use of colour. Resene Black was used as a strong background, allowing the white (Resene Zylone Sheen in Resene Alabaster) and accent red elements to pop. With the concrete ceiling exposed, it also exposed a crisscrossing of existing services from upstairs tenancies, leading to a complete matt black ceiling with the white cable trays distracting from anything above. The play of white and black on the walls and joinery was used to attract the eye to signage and the aeronautical features of a wall hung airplane nose and aluminium wing countertop, all supporting the overall product concept. Being a space in much need of repair when the fitout started, everything needed to be monitored and adjusted as the condition and location of existing elements presented themselves.